In September 2017, I was invited to build a project for the new lifestyle talk show Pickler & Ben, hosted by Kellie Pickler and Ben Aaron. 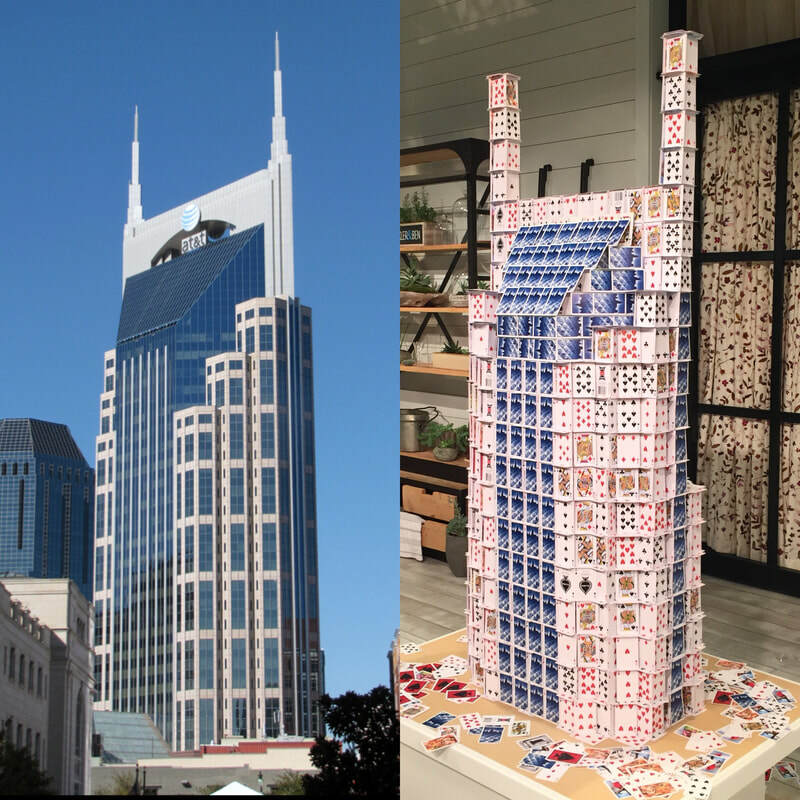 The show tapes in Nashville, TN, so the producers thought it would be fitting to construct the most unique and recognizable building in Nashville - the AT&T building (aka the "Batman building"). Completed in 1994, The AT&T building is the tallest building in Nashville at 617 ft. It is colloquially known as the Batman building because of its two unique spires and sloped facade that bear a rough resemblance to Batman's cowl. Overall, this was a very fun design to capture in cards. As built, this project took about 10 hours to complete and used about 150 decks of cards. The scale I had originally planned in order to capture some of the more subtle architectural details was simply not feasible due to the build time allotted. Upping the scale even slightly to be able to capture more building detail would have easily added another 5-6 hours to the construction time. As built, I even left the rear non-camera facing side of the tower unfinished, because about halfway through I realized that building the entire structure was going to run up too close to the taping time.